Tarasand sits on the waterfront in Cayman Kai within Rum Point along the north coast. This two story luxury villa is a great family or couples choice and offers barefoot swimming from it’s palm-shaded beach. At the end of a quiet cul-de-sac, Tarasand is extremely private and the chances are high that you will not see a soul on your beach the entire stay. Lounge in the oceanfront hammock on the white-sand beach, or enjoy the sunsets from the multiple decks; luxurious interiors and great design compliment the excellent Caribbean views. Plenty of oceanfront windows and sliding doors fill the living area, kitchen and bar with sunlight and panoramic views of the azure waters off of Cayman Kai. The fully equipped, modern kitchen offers all the standard appliances, dishware, cookware and cutlery. Sunsets are especially enjoyable from the decks at Tarasand. Facing southwest, the setting sun provides a wonderful warm end to an active day of snorkeling, SCUBA diving or just relaxing in Grand Cayman. The white sand beach not only offers barefoot swimming but has lounge chairs, a palm-shaded hammock and a Propane grill for cooking by the sea. Housekeeping available as an option. Arrange directly with on-island manager upon arrival. — We strongly recommend purchasing CSA Travel Insurance to offset unforeseen cancelations, medical emergencies, or travel delays. Plenty of oceanfront windows and sliding doors fill the living area, kitchen and bar with sunlight and panoramic views of the azure waters off of Cayman Kai. Enjoy sunsets from the home's multiple decks. Family trip of a lifetime celebrating several significant birthdays. Tarasand was spacious, bright and comfortable opening out to a beautiful view from private beach. Set in quiet neighborhood. Enjoyed the well equipped kitchen. Memorable vacation in beautiful setting on lovely island. Our group of 8 adults absolutely loved our home for 1 week at the north end of Grand Cayman. We were able to see most of the island but were very content hanging around our home, as we had it all. The home had plenty of room and we never felt crowded. We loved that we could always find shade on our beach. We were within walking distance of both Rum Point and Kaibo. What a great place to have a relaxing vacation. The lushness of the landscaping exceeded our expectations. To wake up to the view everyday was more than amazing. Thank you for your kind words! Great location and great, well-maintained home! We loved Tarasand. This is a great property for folks with kids. It is right on the beach and the floor to ceiling windows make it easy to watch them as they play. The water is warm and calm. There are good number of activities but Caman Kai is not too busy and has a nice, relaxed community feel. The restaurants are convenient and good. We highly recommend it. Tarasand is a beautiful villa. Large kitchen, very spacious layout. A perfect tropical private beach with plenty of room for sunning and palm trees for shade. The property was very clean upon arrival. Chloe, our island contact was very accommodating and helpful. I would recommend this villa to family and friends. We are planning to return next year. Tarasand is truly a gem, with impeccable interior and exterior design. It has a very open layout, filled with natural light. The views from every room are breathtaking. The property is perfectly located in an area of calm waters, yet brilliantly gleaming blue and green waters against the sandy beaches. The well-appointed furnishings present as a model-home - exquisite taste and quality. Our family includes three children 5-10 years old, and Tarasand was above and beyond anything we could have imagined. The private beach, allowed the children to be in Heaven our entire stay. The property owners are of an exceptional caliber - an issue out of the owner's control arouse, yet the owners went above and beyond to make it right. Grand Cayman Villas really manage this property well - any request has been addressed immediately and satisfactorily. The listing description is accurate and the property is clean and well-maintained. Highly recommend this property - if you are looking for a worry-free vacation - this is it! Every vacation traveler has two basic concerns: is the destination exactly as advertised - and - what happens when unexpected things happen? Neither one of these worries is valid with the Tarasand Villa. The place is exactly as advertised, perfect in every aspect. It is obvious that a whole lot of thought was put into the villa, when it was built. It offers every possible amenity a family would need. Perfect layout, great quality furniture, awesome kitchen and all necessary appliances and kitchen tools. Secluded place, perfect private beach, perfect for families with kids who can play outside while supervised from the living room. One night due to a tropical storm the power went out. Chloe - the property manager - was more than great in her responses. All our concerns were addressed immediately with above and beyond solutions. These people really care about what they do and try to offer a perfect vacation experience. We spent 11 nights there, enjoying every bit of our time. Fully recommend this place as a sure thing for anyone who is looking to be away from the usual tourist traps and crowded resort areas. 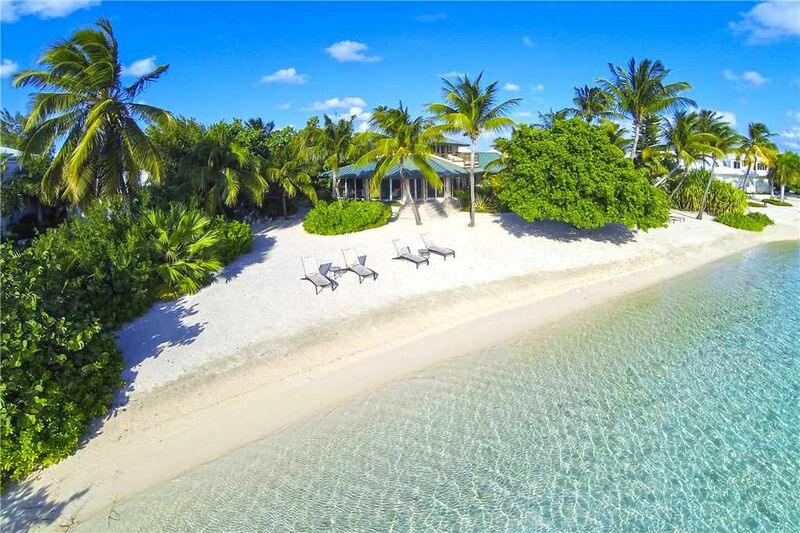 The homes on the sound front in Cayman Kai offer the best beaches as they don't have as much marine and plant life inhabiting the shallows. The beaches are typically soft white sand. The homes facing west offer barefoot swimming in shallow calm waters. The homes facing south (Kaibo Condos & Pools of the Kai) have great white sand beaches, but softer sea bottom. You will probably want to walk across the street to swim in sandier water. The sunsets here are also wonderful, but the big draw to this area is the proximity to the Rum Point Club, a public beach club that offers a fantastic barefoot beach, many water sports, a restaurant bar and grill, a gift shop, and pick-up beach volleyball games. Also near Rum Point is the Kaibo Yacht Club restaurant, bar and marina.